80% of Amazon’s bestselling books are available on the Kindle but on average they’re 10% more expensive than the physical book. Although e-books and reading on devices such as the Amazon Kindle are becoming more popular by the day, not all books are yet available electronically. Furthermore, they’re not always cheaper as we would expect. In an analysis of Amazon.co.uk’s top 100 bestselling books, we found that 82% of Amazon’s bestsellers were available on the Kindle format. On average, the e-book was 9% dearer than the physical counterpart. 2 Why do Kindle e-books cost more? 3 How about when you consider the cost of delivery? 4 Is there a correlation between the cost of Kindle e-books and printed books? 5 Where can I find out more about Kindle? 6 Which books were considered in your study? We considered the 100 bestselling books on Amazon.co.uk on the 12th June 2011. Of these 100 titles, 93 of the titles were available to order and had a published price. These 93 titles form the basis of our analysis. The other 7 titles were only available for pre-order so are excluded from our analysis. 82% of titles are available in the Kindle e-Book format. Of the 93 titles considered, 76 were available in the Kindle e-Book format (81.7%). All 93 were available in printed format: 67 as hardback and 78 as paperback (72% and 84% respectively). On average, Kindle e-Books are 9.2% dearer than physical books. 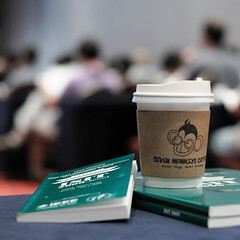 We considered the 76 titles which were available in both printed and Kindle e-book format. The total cost of these titles on the Kindle format was £431.58 (£5.68 per e-book) compared to £395.33 (£5.20 per book) for the physical book. The total RRP of the 76 books is £814.28 (£10.71 per book). 50% of titles are dearer on the Kindle. Of the 76 titles available in both formats, 38 of them were dearer on the Kindle and 38 were cheaper on the Kindle. Of the 38 titles which were cheaper on the Kindle, the average saving is 70p per book. Of the 38 titles which are dearer on the Kindle, the Kindle edition is £1.80 more expensive on average. Once a paperback edition of the book is available, the Kindle e-Book is 11.8% dearer on average. Considering only the 67 titles available which have been given a paperback release (and for which a Kindle edition is available), the Kindle edition is 11.8% more expensive on average. The total cost of these 67 books on the Kindle format is £356.12. This compares to £318.92 in the paperback format. 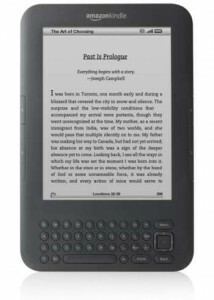 Why do Kindle e-books cost more? E-books are usually assumed to be cheaper than their physical counterparts due to the fact they do away with the costs of printing and delivering a physical book. 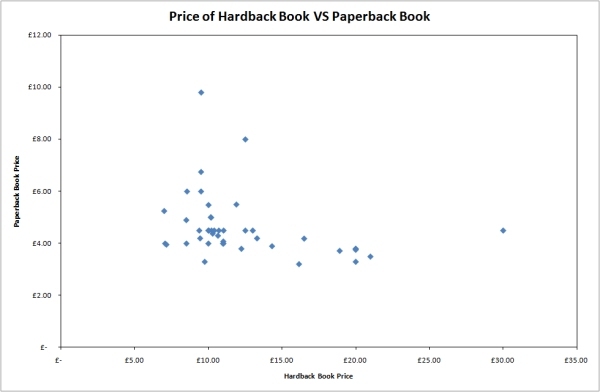 However, our analysis has shown that this is not actually the case: the physical book is often cheaper. This warrants some kind of explanation. Firstly, much of the cost associated with publishing a new title happens before a single book is even sold: for example the cost of research, marketing, copy editors, lawyers and so on. These fixed costs need to be recovered through the sales of all books – regardless of whether they’re in print or electronic. In conclusion, the revenue that Amazon actually makes from the sale of an e-book is less than the revenue from selling a physical book. The primary reason for e-books being more expensive than their physical counterparts is due to UK government tax rules. How about when you consider the cost of delivery? Amazon.co.uk offers free “Super Saver” delivery (delivery within 3-5 business days). As we expect the majority of people to use “Super Saver” delivery, we have neglected the delivery costs in our comparison. If the price of next-day delivery or express delivery is included in the consideration of physical books, the e-book would typically work out to be cheaper. Delivery of e-books is always faster and more convenient as e-books can be delivered electronically and instantly. 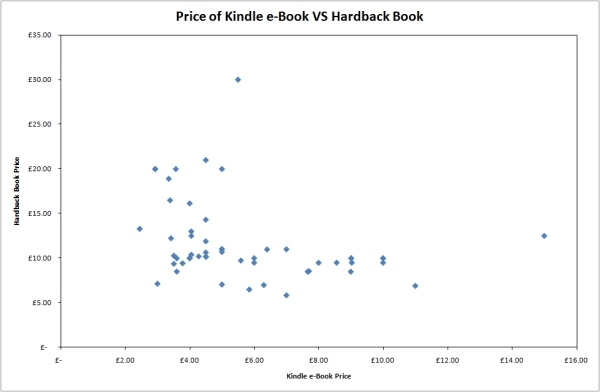 Is there a correlation between the cost of Kindle e-books and printed books? 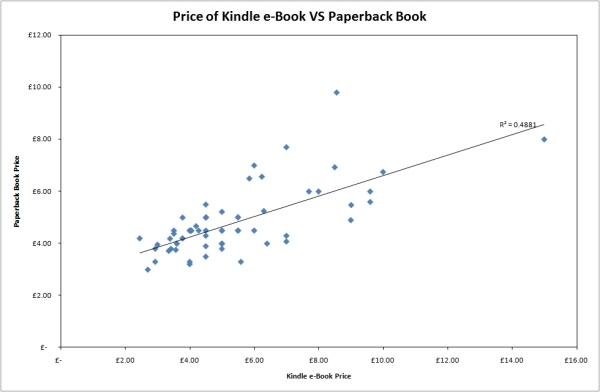 There is a fairly reasonable correlation between the cost of Kindle e-books and the corresponding paperback edition (the paperback is typically cheaper). Interestingly, no such correlation exists between e-books and the corresponding hardback edition. For good measure, a comparison of the price of hardback and paperback editions shows no obvious trend. We’ve got an in-depth comparison between the wi-fi and 3G versions of the Kindle and a guide to getting free web browsing abroad with the 3G Kindle. You can also find out more about the Kindle on the Amazon website. The Kindle is available to purchase from Amazon.co.uk. You can buy a Wi-Fi Only Kindle for £111 and a 3G & Wi-Fi Kindle for £152. We considered the 100 best-selling books on Amazon.co.uk on the 12th June 2011. Of these 100 top titles, 93 were available for order. The basket on which we base our comparison of the price of e-books and printed books is comprised of the 76 titles available in both formats. The price of the Kindle e-Book is compared to the cheapest printed book (whether that is hardback or paperback). Prices of individual books on Amazon.co.uk will fluctuate from day-to-day but as we have considered a large sample of bestselling books, we believe the general conclusions of the study are valid. The price of audiobooks was recorded as part of the study but was not considered. This study was carried out on 12th June 2011. A similar study was carried out on the 31st December 2010.